Liquid Technology is a leading provider of accurate and efficient end-to-end IT asset disposal services and environmentally-responsible recycling for all of your excess, end-of-life hardware. Our enterprise-class IT asset disposition (ITAD) services deliver organized, documented and fully auditable results that are consistent with today’s highest security and environmental standards. Liquid Technology adheres to all current DOD and NIST standards for safe and secure data destruction as well as the EPA’s national guidelines for environmentally-responsible IT asset disposal and e-waste recycling. Our state-of-the-art IT asset disposition services ensure that your company’s information, data and equipment are professionally handled and secure at all times. We provide a full chain of custody documentation and our services are fully insured for your protection and peace of mind. Liquid Technology also understands that not every piece of equipment slated for disposal is quite ready for recycling. In many situations, upon evaluation, it may be determined that some equipment may still have residual value that allows a company to get a return on their investment. If this is the case, a Liquid Technology asset recovery specialist can help maximize your return. For many companies, the ROI they receive can often offset the expense of the IT asset disposal services. 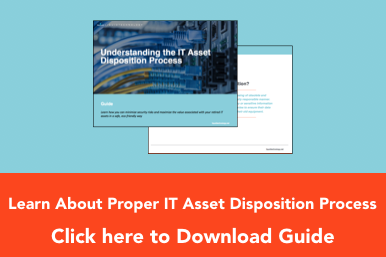 To learn about the best practices for a secure and responsible IT asset disposition process, click below to download our guide. Need a National ITAD Provider? Contact Liquid Technology Today! Liquid Technology is headquartered in New York City but we have satellite offices strategically placed around the country which allows us to provide ITAD services virtually anywhere. Contact our offices today by calling toll-free (800) 797-5478 and one of our Assessment Specialists will help you schedule secure, compliant IT asset removal, disposal, and recycling. Or, if you prefer, you can contact us by email or simply complete our quick form and we will promptly respond to you. Feel free to include a spreadsheet of your excess computer hardware to help expedite the process.